Original abstract still life oil painting. This colorful oil painting focuses on the rich texture of patterns enveloped within a still life. 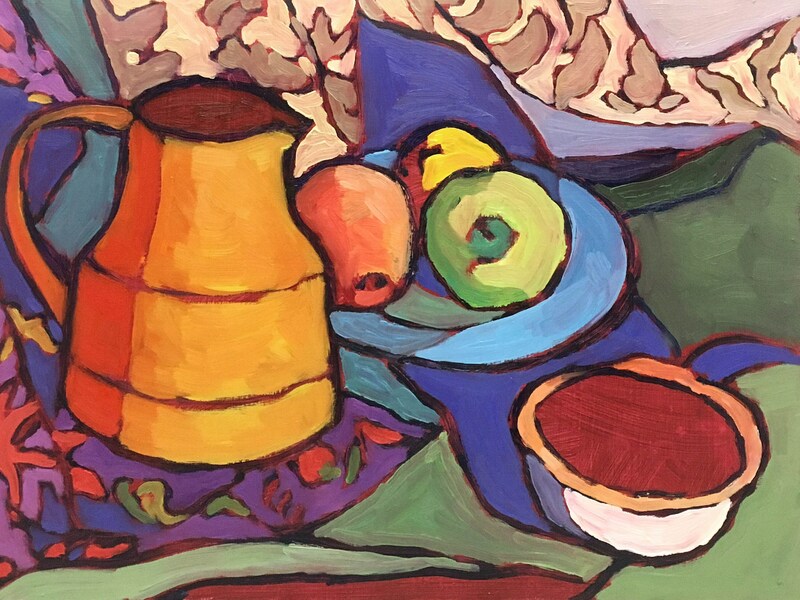 Color and line relationships are explored through an arrangement of fruits and utilitarian wares. The pitcher and bowls were handmade and selected for that reason along with their simple form. The heavily patterned fabrics incorporated around those pieces provided a rich framework for the still life to evolve. The painting is abstract in nature with the shapes taking on a somewhat flattened appearance which renders them to be more like puzzle pieces with in a whole. This is another theme within my work that I continue to explore. The colors are vibrant and the artwork contains visible brushwork and texture. This still life is a signed original that is ready for framing and was painted on an Ampersand (TM) panel. If you have any questions on this oil painting or others within my shop, please convo me. WWW.RENDEREDIMPRESSIONS.COM for more information and insight! Love this painting. I really love the purple lilacs. Finally got the plein air frame and it looks even better. It is mounted with the other 3 I purchased. Thanks so much. Again I added a picture but no success. Love this painting. Love the colors and the subjects selected. Finally got the plein air frame and it looks even better. It is mounted with the other 3 I purchased. Thanks so much. I tried to upload a picture but I don’t think it worked. I accept PayPal for all purchases. Commission work will begin upon receipt of and agreed upon non-refundable retainer. Note: 6.625% State Sales Tax is charged for purchases by residents of New Jersey. Purchased art is returnable within 14 days from receipt and at the customers expense. Commission paintings are not returnable. I ask that you please contact me in advance with your reason for the return and that the art is sent back in the original carton and condition in which it was received. A refund will be processed upon receipt and inspection of the work. I highly recommend insuring the return. If the art is lost in-transit or damaged you will be able to obtain your refund from the mail carrier. Generally speaking I have a goal of having your package in the mail within 3 days from receipt of payment. All purchases over $200.00 will be sent with a signature required for delivery and insurance. Please note that the my shipping charges include a cost for packing materials as well as shipping. Paintings need special attention and packing in order to insure their safe delivery. Sometimes oversize boxes are also required. Please allow extra time around the holidays. If you are interested in a faster method of delivery please contact me for pricing and options. I do accept commission work. If you have an idea that you would like considered please feel free to present it.